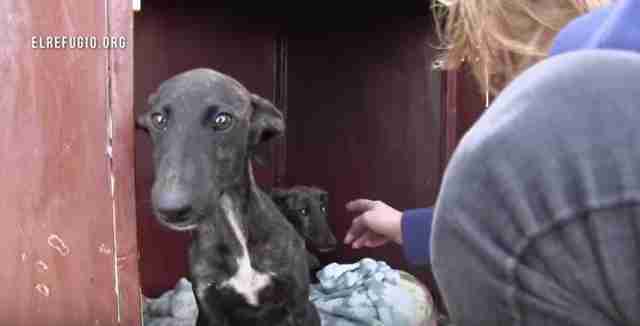 A pair of forlorn greyhound puppies found in the scrublands of Spain had everything against them. Abandoned. Starving. One of them was blind. But even in that darkness, there was a light: the unbreakable bond between a brother and sister. Residents at a women's shelter near Madrid came across the siblings, as one of them, the brother, led his blind sister on a search for food. 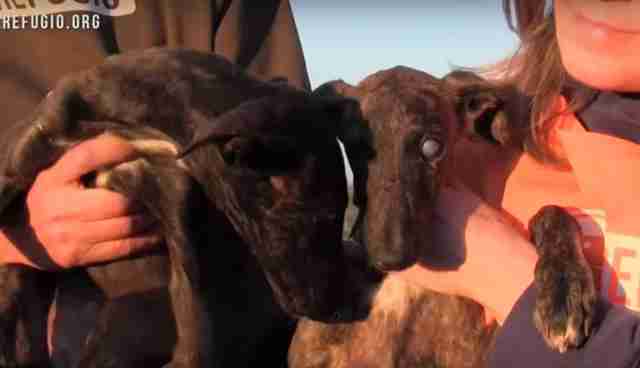 "On approaching the dogs, it was possible to see that one of them had a cloudy veil covering the retina of the eyes," Nacho Paunero, the head of El Refugio, wrote on the website. "Her brother seemed to be fully aware of the blindness of his sister and would not be separated from her for a single second. He was protecting and guiding her." And then it was time for the kind to lead the blind. Dubbed Pisper and Blinder (you can probably guess who was who), the dogs were taken to a local veterinarian. An infection was determined to be the cause of Blinder's condition. A full recovery is expected. Along the way, Pisper and Blinder have become poster puppies for sibling loyalty. With so much national and global attention focused upon them, they're likely to be a good-news animal story from a place not entirely famous for happy endings. 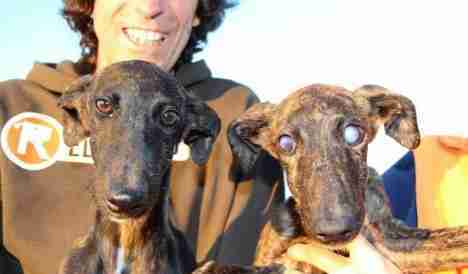 Some 50,000 greyhounds, according to some estimates, are abandoned in Spain every year. Even worse than abandonment, many dogs are routinely killed in what Vice magazine has dubbed a "greyhound holocaust." "If the dogs are too old to hunt, or too hungry to afford until the beginning of the next hunting season, then a greyhound owner might choose to hang the dog instead," the article states. From that darkness, a pair of unlikely celebrities has emerged. Perhaps, it's the universal resonance of an unbreakable sibling bond. As Nacho Paunero writes on El Refugio's website, "It reminds us once again that humans have a lot to learn from animals that live with us on this planet, and they deserve our respect and affection, as well as our assistance in any situation requiring it." And, hopefully, it's also reminder to us all that love and loyalty can flourish, even in the tiniest of hearts. If you would like to help Pisper and Blinder or support efforts to ease the suffering of animals in Spain, visit El Refugio's website.